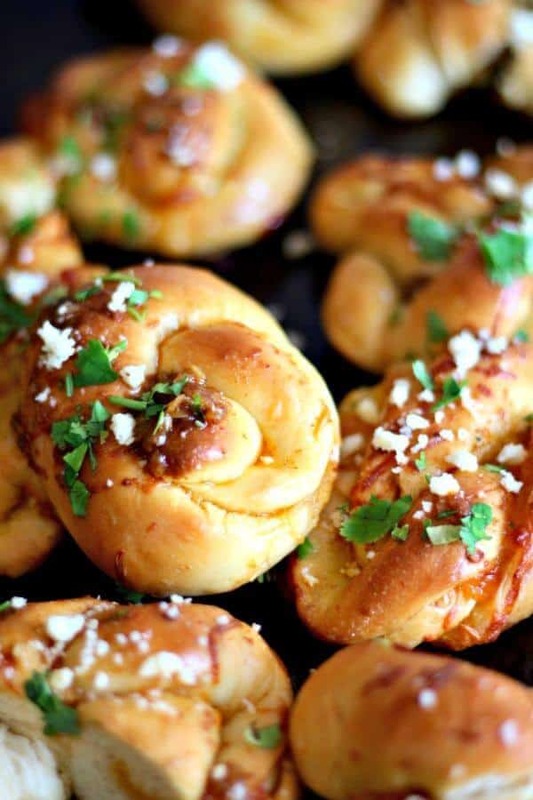 If you love garlic knots you are going to adore these Texas Knot Rolls! Tender white dough is formed in a knot, baked, and then dipped in a Tex-Mex seasoned melted butter and sprinkled with cilantro and Cojita cheese. Serve them warm with a tortilla soup or white chicken chili! I love fresh, warm rolls with dinner. Understand that I am not saying that I make them, or have them, every night. It’s just that whenever possible I love the smell of yeasty rolls baking in the afternoon and dinner just seems complete when I actually get a batch on the table. I blame those 1950’s sitcoms. Garlic knots are a personal favorite. Warm bread, melted butter, and garlic is a winning combination in my book. I was about to make garlic knot rolls the other night when it occurred to me that I had some taco seasoning that needed to be used up. Y’all know I love those spicy, warm, Tex-Mex flavors! So… I did it. I baked the rolls, then melted butter and stirred in the taco seasoning. I chopped up some cilantro and crumbled some queso fresco to sprinkle on the top. The kitchen smelled amazing between the bread in the oven and the taco seasoned butter on the counter – it had my stomach rumbling. As soon as the rolls were cool enough to handle I dipped them in the seasoned butter and then sprinkled them with the chopped cilantro and queso fresco. They were as good as I thought they would be. I tried to stuff some of them with pepper jack cheese but I didn’t like the result. I still think it’s a great idea and I’m going to continue to work on it. I’ll update when I get it to work the way I want. Here in the Dallas area it is 83 degrees. In August. My children are wearing hoodies. It’s rainy, too. Totally weird for my area. In fact it is more like late October weather than mid-August weather. Maybe that’s why I’m in the mood for soups, stews, and all things fall! You can freeze these baked or unbaked. Just don’t dip them in the butter until you are ready to serve them. If you freeze them unbaked let them thaw over night in the fridge then let rise on the counter for 40 minutes or so. Bake as usual then dip them in the butter mixture. I use Red Star Yeast from Amazon because I can buy it in bulk and it is very affordable that way if you make a lot of bread. The company told me that they don’t recommend doing that because the yeast may not be fresh. I have never EVER had a problem and the yeast has always worked just fine. Buying spices in bulk is good, too, if you go through a lot. I like this organic taco blend from Frontier. I think you are going to love these! 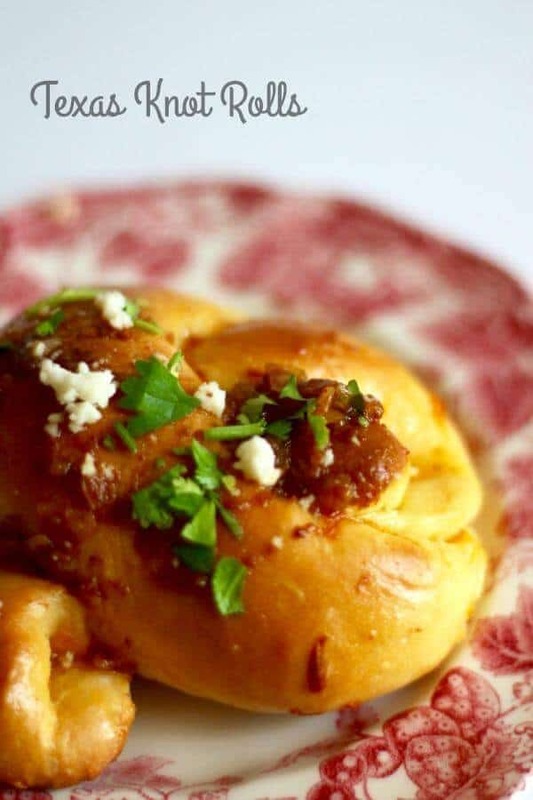 Here’s the Texas Knot Rolls recipe. 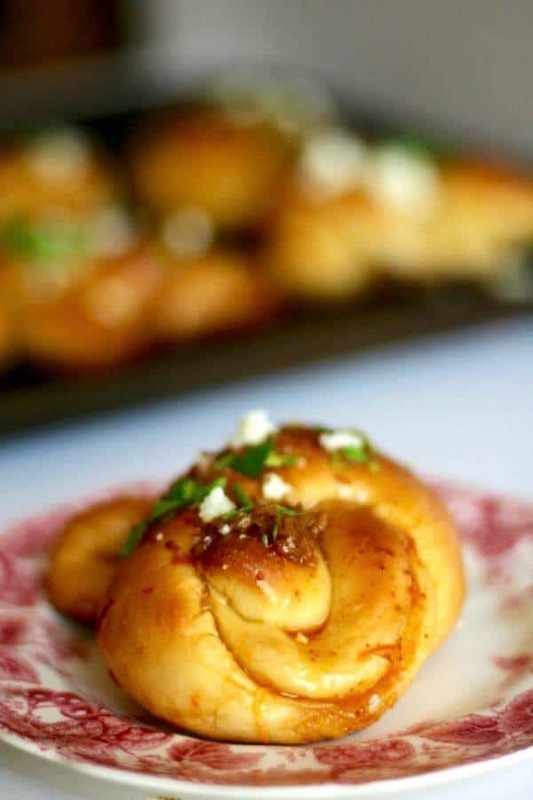 Warm, yeasty knot rolls are dipped in a Tex-Mex seasoned melted butter and sprinkled with fresh cilantro and Cojita cheese. Perfect with Southwestern soups and casseroles. Combine the yeast, 1/2 cup warm water, and 1 tablespoon sugar. Stir to dissolve and set aside. Combine the 1 cup simmering water, 1/2 cup melted butter, potato flakes, sugar, and salt. Stir well and cool to lukewarm. Add 1 cup of flour to the potato mixture. Add the yeast mixture and beat until the batter is smooth. Gradually add enough of the remaining flour to make a soft dough that pulls away from the sides of the bowl. Turn over to grease the top. Cover and let rise in a warm place until double - 1-1/4 hours. Turn the dough out onto a lightly floured countertop. Divide into 24 equal pieces. Roll each piece into a rope. Tie each rope into a knot. Let rise about 45 minutes, or until doubled. Blend the butter and taco seasoning, whisking well. Dip each baked roll in the mixture and place it on a baking sheet. You'll need to stir the butter mixture often to keep it well mixed. Sprinkle the chopped cilantro and Cojita cheese over the rolls. Place in a serving dish and serve hot. These would be great for any dinner! yum! These look positively butter and delicious! They are SO good. I love Tex-Mex flavors. Pretty sure I can smell these from here! They look amazing, and I love the garlic butter and the Cojita cheese! Nope, I’ll keep my fall weather. LOL!